But the comic format was compelling: a few visionaries saw the comics’ potential for teaching while entertaining. One of these was Albert Lewis Kanter, who dreamed of using the comic book form to introduce children to the classic literature he loved. From Kanter’s vision, determination and business skills emerged what would become known as CLASSICS ILLUSTRATED. In recent decades, particularly during the recent Civil War sesquicentennial, archeological investigations of war-related sites of all kinds has attracted both popular and academic attention. Arkansas has not been immune to this activity: battlefields, encampments and civilian sites associated with the war have all received attention. Archeologists, both seasoned professionals and enthusiastic lay persons working with them, have added layers of understanding to the deceptively complex history of the great conflict as it played out throughout this state. “Aftermath,” the Capitol’s fall exhibit, highlights recent archeological investigations at a small sample of Arkansas’s nearly three hundred identified Civil War-related sites, including work performed during the Civil War Sesquicentennial.Produced in collaboration with the Arkansas Archeological Survey, with the cooperation of the National Park Service and the Department of Arkansas Heritage, the exhibit samples past and ongoing investigations to illustrate how archeology can help scholars and the public both understand the war and appreciate its outcomes. “Aftermath” features artifacts and graphics from both military and civilian Civil War sites.Projectiles and fragments recovered from the Pea Ridge battlefield illustrate how analysis of their types and locations can reveal much about how Federal and Confederate forces were armed and their respective positions during the battle. A broken clay pipe bowl and fragments of a bottle of patent medicine recall the relatively comfortable life of a Hempstead County ferryman and his family.A single bullet from a .52 caliber Sharps carbine stands as the first hard evidence of the location of an eastern Arkansas battlefield long thought lost. Ceramics recovered from a Little Rock construction site form a link between the present and antebellum days in the state’s center of politics and commerce, while a “minie ball” found on the Capitol grounds hints at the site’s martial past. These and other artifacts remind us that Civil War archeology touches on much beyond military campaigns and engagements, and that what has been accomplished in this field is a barely a foretaste of what remains to be done. This year, the Arkansas History Commission marks 110 years of collecting and preserving the source materials of the history of Arkansas with an online exhibit, “Tales From the Vault,” showcasing these state treasures. The Capitol’s summer exhibit, of the same name, brings visitors face to face with some of these documentary gems, chosen by the Commission archivists themselves. 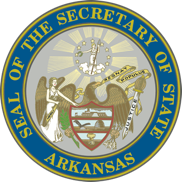 In 1905, the Arkansas History Commission was created by the General Assembly to be the official archives of the state, responsible for collecting, preserving and publishing historic records and other materials central to understanding the state’s history. The brainchild of University of Arkansas history professor John Hugh Reynolds, the Commission had no physical seat until 1911, when Governor George W. Donaghey offered the Commission space in the new, as-yet uncompleted Capitol. The Capitol would be the Commission’s home for the next four decades. During those years, under the direction of Dallas T. Herndon, the Commission would amass the core of its unequaled collection of Arkansiana. “Tales From the Vault,” the Commission’s online offering, consists of 110 favorite items chosen by staff members, one for each year of the Commission’s service. The Capitol installation features a wide sample of these staff choices, including minutes of the first meeting of the Arkansas History Commission, a headscarf worn by an Arkansas WOW (Woman Ordinance Worker) in a World War II-era defense plant, a rolling pin used in the household of early Arkansas missionary Cephas Washburn and a light-hearted letter penned by Washburn’s son, artist Edmond Payson Washbourne, while in camp during the Mexican- American War. Two selections recall the Commission’s long history with the State Capitol: a souvenir of the Capitol’s November 1900 cornerstone laying, and the 1903 contract between the Capitol Commissioners and contractors Caldwell & Drake, for completion of the building by December 23, 1905. Each item’s label offers detailed descriptions and information including archivists’ statements on why they chose each particular item for inclusion. “Tales From the Vault,” the Capitol’s summer exhibit, is currently on view in the Capitol’s first-floor galleries, through Labor Day. In 1966, a small group of Arkansas historians and curators founded an organization of museums, for museums. For nearly a half century, the Arkansas Museums Association has represented the museums of our state, serving as a unified voice in pursuit of their common goals and providing training, support and communication within the profession. Over the decades, AMA member institutions have made exhibits at the Capitol possible, by providing artifacts, images and curatorial know-how. This spring, the Capitol’s first-floor exhibit salutes the organization and its members with Show and Tell: the Work of the Arkansas Museums Association. Artifacts and images chosen by the museums themselves crowd the Capitol’s display cases, giving visitors a taste of the depth and variety of what Arkansas’s museums offer. Brief narratives tell the museums’ stories and colorful graphic interjections provide descriptive and statistical vignettes. Memorable exhibit elements include a home-made diving helmet used before World War II by amateur pearl-seekers in the White River, an engraved Colt percussion revolver that was the sidearm of General Benjamin Bonneville, Army officer and western explorer, who retired to Fort Smith, a rare volume of homilies for children, illustrated with hand-colored lithographs of common garden insects, a plate excavated from behind the home of Arkansas’s earliest known Jewish settlers and a newsletter produced by World War II-era Japanese-Americans interned at Camp Rohwer in the Arkansas Delta. Individually, these items are treasures. What they represent is even greater: Arkansas’s museums care for a huge, rich historical and cultural legacy. What’s at the Capitol this spring is just a taste of what they offer their visitors and their communities. Today, the Association links nearly 400 members, representing over one hundred museums, collections and organizations across Arkansas. The Association is their partner in advocacy, helping them preserve and make available Arkansas’s historical and cultural heritage. Show and Tell: The Work of the Arkansas Museums Association, will remain on display through May in the Capitol’s first floor galleries, immediately north and south of the ground floor rotunda area. 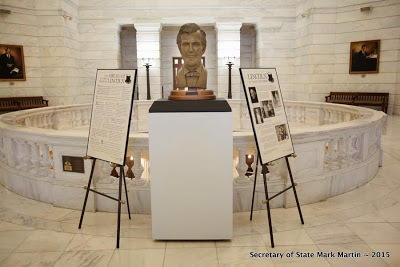 In February 12, the Capitol hosted the unveiling of a hand-sculpted bust of Abraham Lincoln in honor of the 16th President of the United States 206th birthday.The larger-than-life equestrian sculpture was on display in the second-floor of the Rotunda through spring. 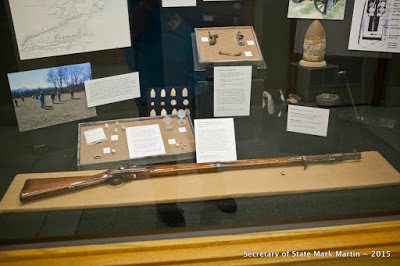 Previously, it was on display at the Lincoln Boyhood Museum in Hodgenville, KY, the Donald W. Reynolds Library in Mountain Home as well as Harding University in Searcy.